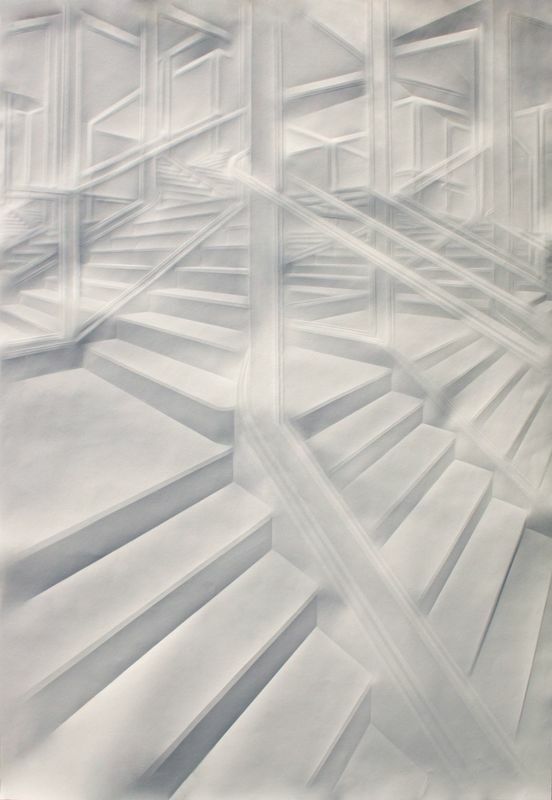 Simon Schubert's monochrome constructions, made solely through creasing and subtle rubbing of white paper, are captivating hybrids of drawing and relief sculpture. In a sense, they're innovations on trompe l'oeil, receding dimensionality suggested by the depth of a crease. These are all interiors: elaborate staircases, mirrored paneled corridors, ornate doorways opening on hallways that lead to doors further on. The most compelling, such as Untitled (Intricated 17) (2018), play actively with reflection and perspective. It's fascinating and original work. This series has been matched with another of works made from graphite powder. The range of black and gray tones and the way that light is captured through them is particularly striking, especially images with windows like Untitled (Hallway) (2017), or those like Untitled (Light on Wall) (2018) that show the play of shadow across a wall. It's a perfect pairing of series that reinforce and deepen each other.